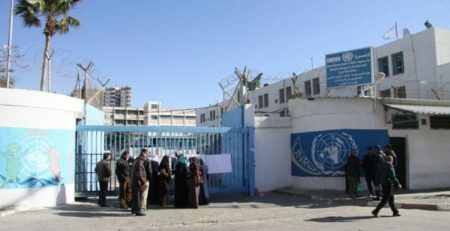 Head of the workers union at the United Nations Relief and Works Agency for Palestine Refugees in the Near East (UNRWA), Suhil Al-Hindi, says that the union has decided to close all UNRWA facilities in the occupied West Bank and Gaza Strip for three days, starting on Tuesday, in a protest against a lack of response to personnel and refugees demands. “This escalation step comes as a response to UNRWA inflexibility, and its refusal to achieve employees’ demands,” said Al-Hindi, according to Al Ray Palestinian Media Agency. He added that the union will also close all UNRWA headquarters and facilities, including health and education, in Gaza, Nablus and Jenin, on November 14. Al-Hindi explained, previously, that protest procedures will not stop until the UNRWA responds to their demands, including the hiring of 450 teachers who passed examinations and interviews, this year. “The UNRWA administration dealt with us in arrogance and insolence. The general commissioner did not communicate with us till this moment, refused to respond to our letters, and did not even appoint a representative to talk with us,” he added. He threatened that, if the UNRWA continues to ignore them without responding, they will take other steps, in escalation, such as an open strike or closing the main headquarters.